It takes a bit to set up the story in X-Men: Days of Future Past. In the 2020s the world is a charnel house as robotic Sentinels have spent decades not only tracking down and murdering mutants, but any “normal” person whose genetic code indicates their children or grandchildren might become mutants. Friends turned enemies turned friends again, Dr. Xavier (Patrick Stewart) and Magneto (Ian McKellen) lead a dwindling number of mutants in fighting back, but it doesn’t look good. However they have a plan. It turns out that they have been saved more than once by Kitty Pryde (Ellen Page) being able to send someone’s consciousness back before an attack to warn the others so they can escape before the attack occurs. Now she has to attempt something never tried before, sending Wolverine (Hugh Jackman) back fifty years – to 1973 – to prevent the moment that would lead to the creation of the Sentinels. Raven, now known as Mystique (Jennifer Lawrence), had murdered Dr. Bolivar Trask (Peter Dinklage), who has been conducting experiments on mutants. As a result of the murder Mystique is captured and her DNA as a shapeshifter is incorporated into the Sentinels. Wolverine not only has to shift gears to 1973, but he has to do what it takes to get young Dr. Xavier (James McAvoy) and young Magneto (Michael Fassbender) to work together again. Unfortunately Xavier is strung out on a drug that lets him walk again, but suppresses his mental powers while Magneto is imprisoned in a secret non-metallic facility deep beneath the Pentagon. Whew. That’s a lot of exposition. "X-Men: Days of Future Past isn't the best of the series . . ."
Once the story gets rolling, though, it does a solid job of telling its story, mostly through set pieces filled with special effects, mutant powers, and action. The Pentagon escape, for example, involves bringing in a young man (Evan Peters) who can move at superspeed and who may be Magneto’s son. There’s only a hint of that relationship, but the film is chock full of references that will play well with long time Marvel fans while not always getting picked up by the rest of us. The scene after the closing credits features a character who is neither seen nor referred to anywhere else in the movie. The Marvel fans in the audience will instantly know who it is. If you’re not one, make sure you see the movie with someone who can provide the necessary footnotes. The film features a large cast with brief appearances by Halle Berry, Anna Paquin, plus a host of shoutouts for various mutants from the comics who don’t play major roles here. The key characters are the young Xavier and Magneto, Wolverine, and Mystique. They’re the ones with the most screen time and whose characters actually develop over the course of the story. 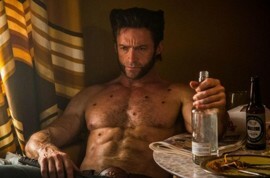 All are played by actors who have played their roles at least once, with Jackman having played Wolverine several times. All turn in solid performances. The only disappointment on that score is with Peter Dinklage and that’s only because he’s not given nearly enough to do. He’s at the center of the story, but his character is really little more than a plot device. Visually the film varies from the murkiness of the future scenes to crisp action scenes set in 1973 at the Paris peace conference and on the White House lawn. Director Bryan Singer, who helmed the first two X-Men films, knows his way around the mythology and, in fact, is reportedly already prepping the next one. X-Men: Days of Future Past isn’t the best of the series but it lets fans enjoy younger and older versions of some of the characters and play in this corner of the Marvel Universe. Next time, though, let’s have a bit less gimmicky plot and instead focus on the real strength of the series, which are its complex characters.